Are you ready for some cupcakes?! Our friends at IEShineOn.com are hosting the first ever Inland Empire Cupcake Fair on Sunday, March 17, 2013! This cupcake filled event will take place at the Riverside Municipal Auditorium. Proceeds from this sweet event will benefit the California Riverside Ballet and Foothill Family Shelter! So not only are you able to indulge in some awesome cupcakes, you're also helping out a good cause! It's a win-win! This exciting event will have cupcakes available to taste whipped up by amateur and professional bakers in the Inland Empire. If you think your cupcakes have what it takes to take home the cupcake glory, apply to be a baker here! Entry is $50. Cupcakes aside, this exciting event will also feature live entertainment, a spa zone with complimentary massages, kids zone with professional babysitters, a complimentary photo booth, and much more! Over 2,000 vistiors are expected to attend so get your tickets today! Early bird tickets are on sale now! Buy your tickets before 3/5/13 to take advantage of the early bird discount! General Admission Tickets are only $15 through 3/5/13! After that, ticket prices are: VIP $25 (1 HR Early Entry, Free Goodie Bag), General Admission $20 (6 Cupcake Tasting Tickets), Group $95 (5 General Admission Tickets). Kids age 3 and under are free so feel free to bring the little cupcake lovers in your life! For more information on the Inland Empire Cupcake Fair please visit: IEShineOn. 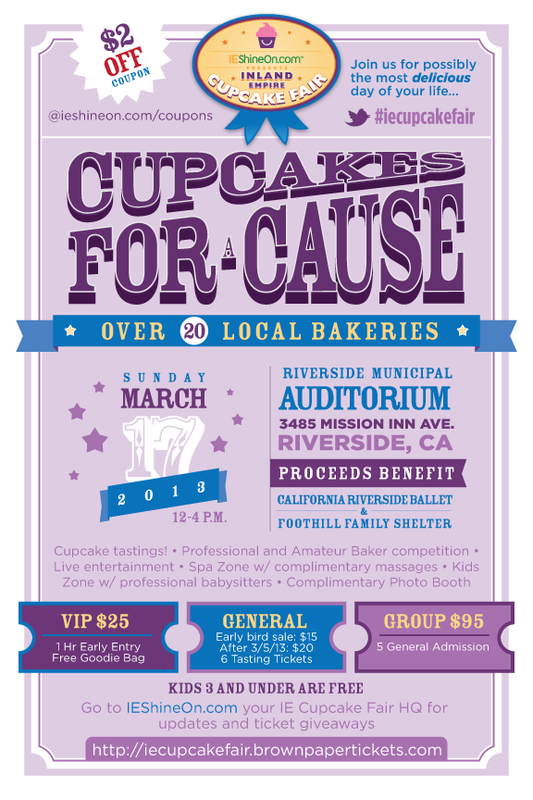 We're giving two pairs of General Admission tickets to the Inland Empire Cupcake Fair! Enter below for your chance to win! Winners will be announced on Wednesday, February 27th! This sounds like such a fun event.